2| Two gametes therefore receive two copies of the chromosome. .and the other two receive one copy. Two gametes receive one copy of the chromosome;. .the other two receive two copies. ^ All three may segregate together; so two gametes receive three copies of the chromosome. .and the other two receive no copies. 9.28 In meiosis of an autotriploid, homologous chromosomes can pair or not pair in three ways. Because all the chromosome sets in autopolyploids are from the same species, they are homologous and attempt to align in prophase I of meiosis, which usually results in sterility. Consider meiosis in an autotriploid ( FIGURE 9.28). In meiosis in a diploid cell, two chromosome homologs pair and align, but, in autotriploids, three homologs are present. One of the three homologs may fail to align with the other two, and this unaligned chromosome will segregate randomly (see Figure 9.28a). Which gamete gets the extra chromosome will be determined by chance and will differ for each homologous group of chromosomes. The resulting gametes will have two copies of some chromosomes and one copy of others. Even if all three chromosomes do align, two chromosomes must segregate to one gamete and one chromosome to the other (see Figure 9.28b). Occasionally, the presence of a third chromosome interferes with normal alignment, and all three chromosomes segregate to the same gamete (see Figure 9.28c). No matter how the three homologous chromosomes align, their random segregation will create unbalanced gametes, with various numbers of chromosomes. A gamete produced by meiosis in such an autotriploid might receive, say, two copies of chromosome 1, one copy of chromosome 2, three copies of chromosome 3, and no copies of chromosome 4. When the unbalanced gamete fuses with a normal gamete (or with another unbalanced gamete), the resulting zygote has different numbers of the four types of chromosomes. This difference in number creates unbalanced gene dosage in the zygote, which is often lethal. For this reason, triploids do not usually produce viable offspring. In even-numbered autopolyploids, such as autote-traploids, it is theoretically possible for the homologous chromosomes to form pairs and divide equally. 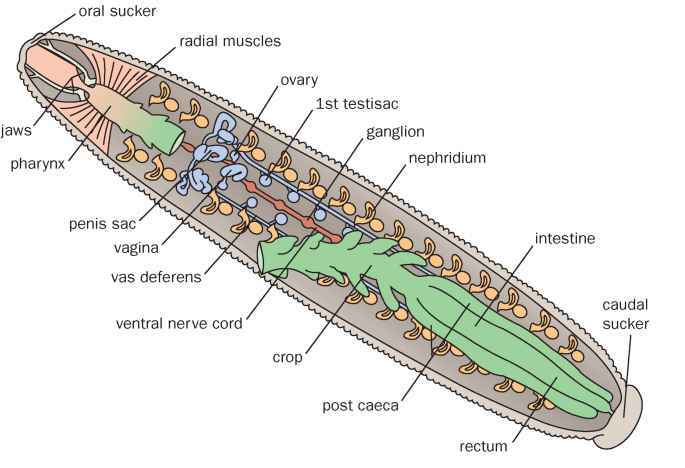 However, this event rarely happens; so these types of autote-traploids also produce unbalanced gametes. The sterility that usually accompanies autopolyploidy has been exploited in agriculture. Wild diploid bananas (2n = 22), for example, produce seeds that are hard and inedible, but triploid bananas (3n = 33) are sterile, and produce no seeds — they are the bananas sold commercially. Similarly, seedless triploid watermelons have been created and are now widely sold. Allopolyploidy arises from hybridization between two species; the resulting polyploid carries chromosome sets derived from two or more species. I FIGURE 9.29 shows how alloploidy can arise from two species that are sufficiently related that hybridization occurs between them. Species I (AABBCC, 2n = 6) produces haploid gametes with chromosomes ABC, and species II (GGHHII, 2n = 6) produces gametes with chromosomes GHI. If gametes from species I and II fuse, a hybrid with six chromosomes (ABCGHI) is created. The hybrid has the same chromosome number as that of both diploid species; so the hybrid is considered diploid. 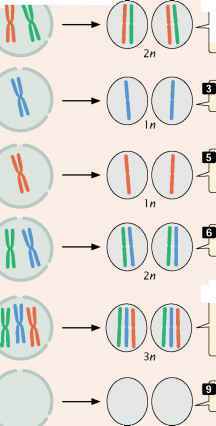 However, because the hybrid chromosomes are not homologous, they will not pair and segregate properly in meiosis; so this hybrid is functionally haploid and sterile. The sterile hybrid is unable to produce viable gametes through meiosis, but it may be able to perpetuate itself through mitosis (asexual reproduction). On rare occasions, nondisjunction takes place in a mitotic division, which leads to a doubling of chromosome number and an allo-tetraploid, with chromosomes AABBCCGGHHII. This tetraploid is functionally diploid: every chromosome has one and only one homologous partner, which is exactly what meiosis requires for proper segregation. The allopoly-ploid can now undergo normal meiosis to produce balanced gametes having six chromosomes. 9.29 Allopolyploids usually arise from hybridization between two species followed by chromosome doubling. somes. To Karpechencko's great disappointment, however, the new plants possessed the roots of a cabbage and the leaves of a radish. In many organisms, cell volume is correlated with nuclear volume, which, in turn, is determined by genome size. Thus, the increase in chromosome number in polyploidy is often associated with an increase in cell size, and many polyploids are physically larger than diploids. Breeders have used this effect to produce plants with larger leaves, flowers, fruits, and seeds. The hexaploid (6_n = 42) genome of wheat probably contains chromosomes derived from three different wild species ( FIGURE 9.30). Many other cultivated plants also are polyploid (Table 9.2). (See next page). Polyploidy is less common in animals than in plants for several reasons. As discussed, allopolyploids require hybridization between different species, which occurs less frequently in animals than in plants. Animal behavior often prevents interbreeding, and the complexity of animal development causes most interspecific hybrids to be non-viable. Many of the polyploid animals that do arise are in groups that reproduce through parthenogenesis (a type of reproduction in which individuals develop from unfertilized eggs). Thus asexual reproduction may facilitate the development of polyploids, perhaps because the perpetuation of hybrids through asexual reproduction provides greater opportunities for nondisjunction. Only a few human polyploid babies have been reported, and most died within a few days of birth. Polyploidy — usually triploidy — is seen in about 10% of all spontaneously aborted human fetuses. Different types of chromosome mutations are summarized in Table 9.3. (See next page). Note: Fig 9.30 to fill this column See art page for exact additions. Polyploidy is the presence of extra chromosome sets: autopolyploids possess extra chromosome sets from the same species; allopolyploids possess extra chromosome sets from two or more species. Problems in chromosome pairing and segregation often lead to sterility in autopolyploids, but many allopolyploids are fertile. 9.30 Modern bread wheat, Triticum aestivum, is a hexaploid with genes derived from three different species. Two diploids species T. monococcum (n = 14) and probably T. searsii (n = 14) originally crossed to produce a diploid hybrid (2n = 14) that underwent chromosome doubling to create T. turgidum (4n = 28). A cross between T. turgidum and T. tauschi (2n = 14) produced a triploid hybrid (3n = 21) that then underwent chromosome doubling to produce T. aestivum, which is a hexaploid (6n = 42).